A2Z transport provides a high quality but cost effective service for people moving house or offices within Cambridge, Milton Keynes, Huntingdon, Peterborough and the surrounding areas. With over 8 years experience of removals within the Milton Keynes & Peterborough area, and much of our work coming from word of mouth, we believe that you will be in very reliable hands. We also pride ourselves on being able to provide the most competitive quotes available for removals in Peterborough and the surrounding areas. 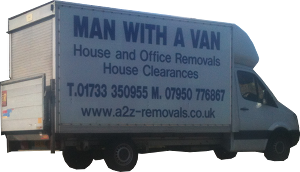 A2Z removals offers removal services at very competitive rates and we strongly believe that every customer should get nothing but an excellent service while expecting good value for their money. Our typical removal customers are movers within the Peterborough and Milton Keynes area who know they are moving house or office and need not cost a fortune in the process. Our home and office removals services can be anything from a standard removals process to a completely bespoke service providing you with the exact needs you require. Being fully aware of how stressful a house move can be, our guarantee is that the actual moving of your possessions is one thing that you will never have to worry about. We will take care of everything within the physical move. From the moment you make contact with us to when you are fully moved in to your new home or office, you can rely on us to have asked all the right questions about your move so that we can provide the best possible service. There is no obligation by requesting a quotation from us and we are more than happy to create a quotation that is tailored to your precise requirements. In addition to removals in Milton Keynes, Peterborough, Cambridge and Huntington we regularly provide home removals, business removals and a man and van service to and from Stamford, Spalding, Bourne, Boston, Northampton and Buckingham. Feel free to have a look around our website and if you have any questions or would like any further information on our services please contact us on either 07950776867 or complete the contact form. We are a well established collection and removals service offering a high quality service to both the home and business market at a cost effective price. Our primary services are collection, delivery and removal of goods from single item removals to small removals covering the Milton Keynes, Peterborough, Cambridge, Huntingdon and surrounding areas.